Felecia Germaine Malone Lewis is a native of Gallatin, Tennessee. She is the daughter of late Will Henry, Sr. and Johnetta Wynne Malone and the oldest of seven children (Trelawney, Margo, Will Jr., Reginald (deceased), Miyoshi, and Samuel). She attended Union Elementary (grades 1-3) then transferred to Vena Stuart (4th grade) as one of the first young black children to attend a white school at the beginning of desegregation in Sumner County, TN. Felecia graduated Gallatin High School in 1975 as one of the Top 30 students of her class. After attending Volunteer State Community College for one year, she transferred to Western Kentucky University and graduated in 1980 with a degree in Journalism and a minor in Speech. She is also a charter member of Sigma Gamma Rho, Eta Phi Chapter, at Western. Felecia began working at RR Donnelley in 1980 and has been with the company for 33 years. She has worked in many capacities at RRD but is currently a Customer Service Representative and Pressroom Supervisor back-up on some weekends. Some of her accounts include Woman’s World and Athlon Sports magazines. While at WKU, Felecia met a young man who swept her off her feet. She married Dwight Lewis in 1981. Born to this union are 2 daughters, Crystal and Andrea. They also have another daughter, Danielle Morris Moore and son-in-law, Errick Moore along with granddaughter, Gabrielle. She is a lifelong member of First Baptist Church and gave her life to Christ under the pastorate of W. L. Shaw. Felecia always knew she was placed in different situations in life but didn’t understand until she was more mature in Christ. Philippians 4:13 is an anchor because she can do all things in Christ who strengthens her. 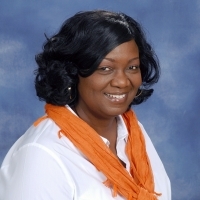 Felecia is very involved in the life of First Baptist Church. To be able to function in so many capacities when her children were small, Crystal and Andrea were, and still are, very involved in ministry of FBC. Her ministry participation, both past and present, includes: FBC Mass Choir, Intercessory Prayer Ministry, Couples Ministry, Member of planning committee for the new addition, Building B that was completed in 2010, served as Co-Children and Youth Coordinator from 1994-2003, taught Sunday School (ages 10-12) for several years, coordinator for Women’s Retreats that she has passed on to her daughter, Crystal, former Church Administrator, former member of Discipleship and Strategic Planning ministries, Sister to Sister Ministry member, Youth Camp Counselor since 1994, TBME Youth Encampment Registrar, Church Directory Committee member, current Children and Youth Ministry Director. In addition, Felecia is involved in various community organizations. She is a former NAACP Youth Council Leader, former coordinator for Gallatin High School Hip Hop Dance Team, currently serving as the United Way Coordinator @ RRD, also serves on the Allocations Committee for Sumner County United Way, former Board Chair of Gallatin Shalom Zone, currently serves on the Executive Committee and Board Secretary of the Gallatin Shalom Zone. Felecia and her husband Dwight were presented with the Shalom Heritage Award by the Gallatin Shalom Zone in 2013 for their commitment to community service. Always a hard worker since age 14, she doesn’t mind helping anyone and has learned to say “No” for her own sanity. Felecia enjoys watching sports, especially football and basketball, and she likes taking pictures in her spare time.